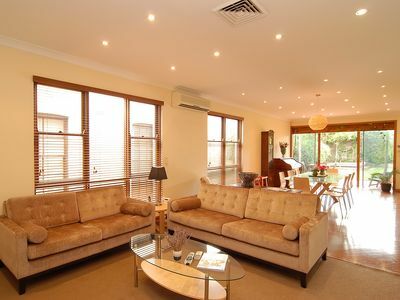 This spacious 3 bedroom home is conveniently located close to beautiful Centennial Park and also Westfield Shopping Centre. Open plan design over a single level, it has warm furnishings, air conditioning and a large modern kitchen with built in fryers, stone grill, gas cooking and breakfast bar. a) Part cancellation of a booking will not be accepted. b) Should the guest cancel up to 3 months before the letting, the guest will be entitled to a full refund of all monies paid less booking fee ($110). c) Within 3 months, deposits on cancelled bookings are only refundable when the premises are re-let for the whole term of the cancellation at the full rent. d) The Landlord may cancel at any time up to 1 month prior to the letting, in which case the guest will receive a full refund. Tracey McArdle Exclusive Properties will endeavour to find equivalent accommodation. a) Rental prices include all utilities (should the bill not exceed normal usage). Should the account be extreme then the guest will be responsible for the difference and previous accounts will be supplied. Utilities does not include telephone calls. b) All telephone calls are charged at an added premium of 55c per call i.e. call cost + 55c = call total charged. During tenancy, telephone accounts will be billed to the guest on a monthly basis and payable within seven days. a) To pay the rent prescribed herein in advance. c) To maintain and leave the premises in a clean, tidy and undamaged condition. In the case of non-compliance a cleaning fee will be charged. d) Not to assign or sub-let the whole or any part of the premises. e) That all damages, breakages and losses to the premises and/or furniture, furnishings and lock and key replacements are to be reported to the Agent immediately. The guest shall be responsible for any damages or breakages and the Damage Account must be paid for by the guest within a 21 day period of billing. f) That at the time of the booking, the Landlord and/or Agent has described the premises and its position to the best of their ability and in good faith and as accurately as possible and that no responsibility or refund for alleged misdescription can be accepted. g) Not to remove any of the furniture or effects from the premises. h) To allow the Landlord and/or Agent to enter and view the state of repair of the premises. i) That the guest or any persons using the premises shall not conduct themselves in a manner which is a nuisance or annoyance to adjoining or neighbouring occupiers and shall comply with the requirements of all statutory laws, regulations and by-laws applicable in respect of the premises. j) That the premises or any part thereof shall not be used for any purpose other than as holiday/corporate short term accommodation and that no more than the occupants named on the front page of this lease are to be accommodated. Occupancy of more than the stated number of persons may render the guest liable to cancellation of the tenancy by the agent. k) That animals are not permitted on or in the vicinity of the premises. If pets are found the guest will be liable for the cost of cleaning and/or fumigating the premises and the tenancy may be terminated by the agent. l) That fish or any other seafood are not to be cleaned or left on the premises. m) That no responsibility is taken for the guests personal property left on the premises and such property may be disposed of immediately by the Landlord and/or Agent. n) That in the event of the premises being offered for sale, to allow the Landlord and/or Agent to inspect the premises with prospective purchasers during reasonable hours by appointment. o) That in the event of the premises being sold, this Agreement is cancelled and all deposit monies will be refunded in full. A minimum of one months notice shall be given. a) The guest must return all keys and vacate the premises by 11.00 am on the day of departure, otherwise rental will be charged up to and including the date on which the keys are returned. b) The guest agrees to allow the Landlords Agent to hold in their possession duplicate keys to the said property. Should any keys be lost, misplaced or broken they will be replaced at the Tenants expense. c) In the instance of a guest locking themselves out after office hours, the guest is to arrange a locksmith at their own expense. d) The guest is required to keep the Agent informed regarding vacating dates, should they differ/change from that on the original lease. Any guest wishing to extend their booking agrees with the Agent to confirm the extension in writing and forward payment on or prior to the day of extension. If the extension is not paid the booking will not be extended. e) The guest agrees to allow the landlords Agent to view the property with prospective clients on the condition that every attempt is made to contact the guest 24 hours prior and/or an agreed appointment is made. f) There are no parties of any type to take place in the property. If there is a party held in the premises there will be an automatic $1000 per day penalty applied to your credit card and you will be evicted from the premises without any refund. g) The guest agrees with the Agent that if there is rent in arrears by twenty one (21) days or more, the Agent has the right to change the locks without notice. h) The security deposit is to be held by the Agent for payment of any outstanding monies owed by the guest during &amp; after tenancy including telephone charges, extra cleaning charges, damages etc: If these charges are greater than the amount of the deposit the guest agrees to pay the outstanding amount in full on account from the Agent. i) The guest agrees that any unpaid account over thirty (30) days will immediately be handed to the debt collector with an incurred fee of 20%. j) The guest agrees that if the agent is charged any fees to receive an overseas transfer of monies to their account, then the guest is liable for this charge &amp; will be added to their account. If any personal cheques are dishonoured, refer to drawer, present again etc, then $25 fee will be incurred and any other cheques will not be accepted thereafter. k) The guest agrees to maintain where applicable, washing machine, clothes dryer, waste disposal unit, refrigerator or dishwasher in good working order and at the termination of the tenancy shall be handed over to the landlord clean and in good working order. l) The guest agrees not to drive nails, screws, or hooks (including sticking hooks) into or in any way deface the walls of the premises. m) If the said property has internet and the internet is deemed not to work because of a problem with the guests computer and is proved to work with the agents computer, the agency will take no responsibility. The agent is not responsible to fix the guests computer. If the agent is to attend the property this will be at a cost to the guest of $50/hour. n) All TVs are tuned prior to tenancy. Should they need retuning during or after tenancy this will be charged to the guest. o) The guest agrees that the Agent or Landlord does not accept responsibility for damage to persons or property whilst occupying the premises. This extends to damage caused by vehicles parked on the roadside in front, rear or near of the property. p) Despite any other provision of this lease, if a goods and services tax (GST) is imposed on any supply made to you in connection with this lease, the amount you must pay for this supply is increased by the rate at which that GST is imposed. The personal information that the guest provides is necessary for the Landlord and/or Agent to verify the guests identity, to process and evaluate the application and to manage the holiday letting and premises. Personal information collected may be disclosed to other parties including the Landlord, referees, other agents and third party operators of tenancy databases. Information already held on the tenancy databases may also be disclosed to the Landlord and/or Agent. If the guest fails to comply with their obligations under this Agreement, that fact and any other relevant personal information collected about the guest during the course of the holiday letting may also be disclosed to the Landlord, third party operators of tenancy databases and/or other agents or as allowed pursuant to the Privacy Act. If the guest would like to access the personal information the Agent holds, they can do so by contacting the Agent at the address and contact numbers contained herein. The guest can also correct this information if it is inaccurate, incomplete or out-of-date. If the information is not provided, the Agent may not be able to process the application and manage the tenancy. Should the guest breach the terms and conditions above then the Landlord and/or Agent may re-enter the Premises. Breach of any of these terms and conditions shall also permit the Landlord and/or Agent to refuse to hand over the keys and/or immediately terminate the holiday letting. I/we the guest do hereby certify that I/we require the Premises for the purpose of a holiday/corporate short term rentals only and that my fixed place of abode is as stated below. Should the guest breach the terms and conditions above then the Landlord and/or Agent may re-enter the premises. Breach of any of these terms and conditions shall also permit the Landlord and/or Agent to refuse to hand over the keys and/or immediately terminate the holiday letting. I/we the guest do hereby certify that I/we require the premises for the purpose of a holiday/corporate short term rentals.